Day 334: Happy 60th Birthday John! A few days ago, my friend Janet asked me to make a pie for her brother-in-law, John. Janet has known about my pie project since day one, and has been an ardent supporter, but this was the first time she suggested someone to gift a pie to. 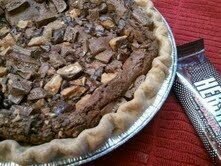 Janet’s sister is allergic to chocolate, and so the pie that I sent, was all about John. And for someone who is always thinking and working for someone else, this pie was a gift just for him… and I hope that John enjoys every bite! I was honored to give a gift to John that was such a treat for him… for all that he does in his ministry. Happy Birthday John… and thank you for all that you do!